A long (in time and space) moving camera shot. 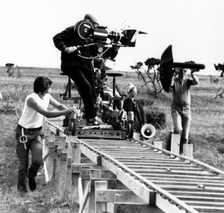 Originally required tracks to be laid down, hence the name; nowadays is often achieved by SteadiCam. A Tracking Shot is often used as an Establishing Shot; it's also essential to the Walk and Talk.